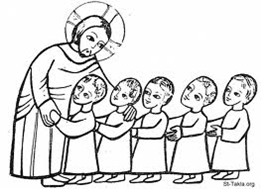 St. Paul’s Religious Education Program for students in Kindergarten through 8th Grade is offered during the school year on Sunday mornings from 9:30 am to 10:20 am. Classes meet in the school. Children in second grade or older and baptized Catholic may prepare for the Sacraments of Reconciliation and First Communion. Children not enrolled in a Catholic school must attend Sunday Religious Education for two years before receiving sacraments. Parents are required to attend six sessions- three each for Reconciliation and First Communion during the second year. Music and prayer that echo and anticipate liturgical celebrations. Scripture, social teaching, vocation awareness, and mission.